Very here for this. Not sure what that says about me, but I really love this. i’m really at a loss of what to think about this. It’s visually arresting and kinda impressive, at the same time the waste of work and resources in pieces that serve as purely visual statements without any sense or meaning does also make me feel a little ill at ease. In fact the more I look at it the more it feels gimmicky and meaningless. 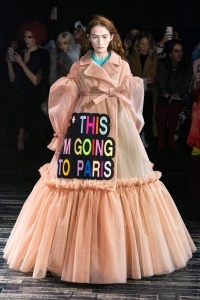 Love this collection, my favourite collection of the whole couture season...because it is just pure mockery of "pretty HC collections". 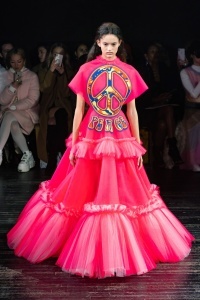 It feels like couture through the eyes of John Waters! OMG! 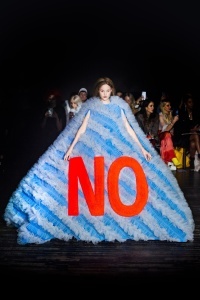 Why is everyone doing huge ugly gowns this season? Instagram has ruined the fashion industry. Wintergreen, GivenchyAddict, Nomar and 9 others like this. I think that is exactly the message they were trying to send here. 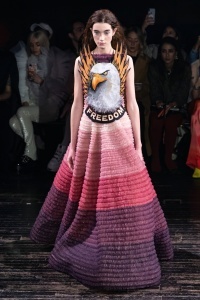 This is V&R, not Jeremy Scott. They are very clearly sending a message with this collection. 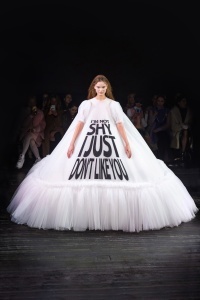 I'm reading a complete f* you to the fashion Gods of today. A campy mockery of the street style troops. TaylorBinque and jeanclaude like this. I think it's absolutely amazing. In a kind of Jordan Wolfson in your face way. There's no compromise. show of the season. Period. 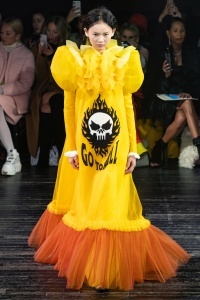 If Demna Gvasalia created over-the-top gowns (esp. 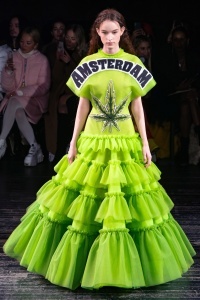 for Vetements) it would have looked exactly like this. And this is not a compliment. Oh V&R, I didn't know how much I need this. It started with some funny amusing looks but end with a thought provoking senses. 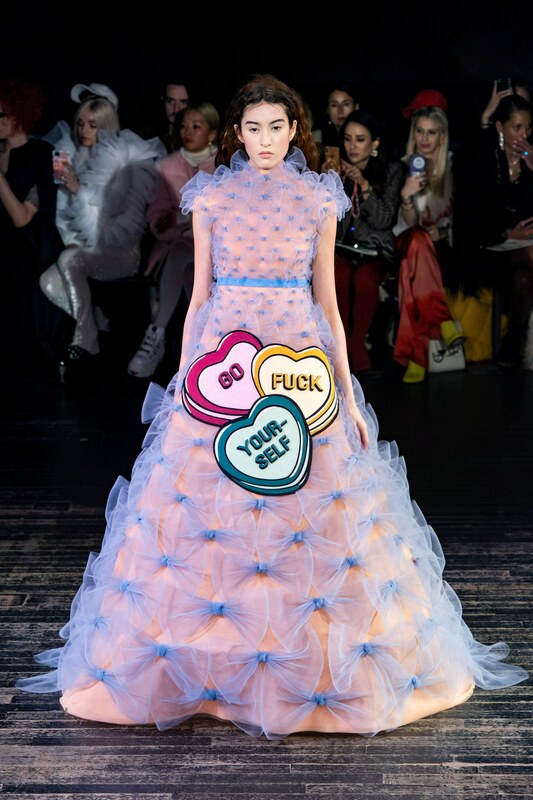 If you remove all the patchworks and stickers, you get some pretty fabulous V&R classic gowns but when they put it on it makes you think how social media has led to the state of fashion today. Also I love the very flat 2-D effect here. phungnam96, perhydrol and sweetpop like this. I kind of need these. I love the contrast of the sweetness and the vulgarity. I'm of similar thoughts and feelings, TaylorBinque! 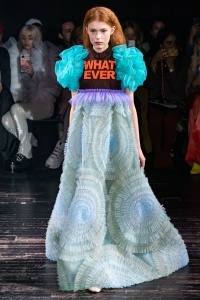 The collection strikes a good balance between responding to the current state of the fashion industry, society even, and V&R being their usual eccentric selves. The collection is amusing, it's fun and its a good build on what V&R have showcased before. Ok... 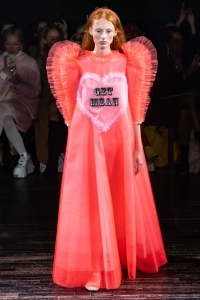 I got it, a instantaneous meme collection, every Viktor and Rolf past collections were always meme worthy so why not do a collection with this propose? 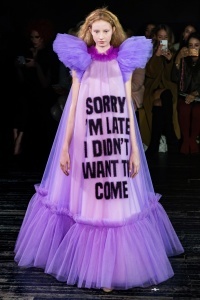 I just wanted that the dresses itself were somehow pretty, they look like they are part of the joke and not instrument for the message, I fell like Im laughing AT this collection not WITH this collection. This is kinda the path that fashion is taking, Balenciaga, Vetements, Gucci... They had been playing with this "meme factor" and it works. 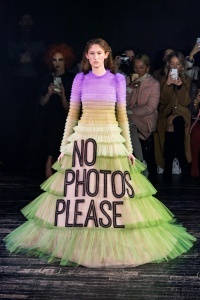 They are making fun of fashion and us, so for once I would like see a collection pointing the jokes on them, unfortunately it was not this time. I think it's what happening as well, particularly eyeing alessandro michele on on side and demna and the like on the other. But that is V&R. Their thing is to take things way too literally. It's their whole concept. 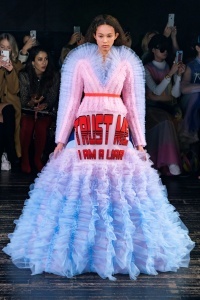 From "(hanger) models", to "(extreme) layering", to "wearable art (paintings)", their thing is all about using these concepts in the most literal way possible. bennyboy and jeanclaude like this.